In his long career as a NASCAR driver and team owner, Glen Wood, who is being inducted into the NASCAR Hall of Fame this month, has been a part of many of the sport’s historic moments. Many of them are associated with his team’s 98 victories in the Sprint Cup division, but one in particular was a rare occurrence for both Wood and NASCAR. Neither came away winners that day. It happened on Sept. 30, 1956, at Asheville-Weaverville Speedway. The race was for NASCAR’s Convertible Division, a circuit that ran from 1956-1959, with Wood being one of the top drivers, In 89 starts, he had five victories, nine poles, 43 top-five and 62 top-10 finishes. 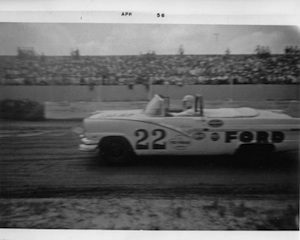 At Asheville that day in the fall of 1956, Wood qualified on the outside pole in a field of 24 cars. Well into the race, it was an all-Ford show at the front, with Curtis Turner leading Joe Weatherly and Wood. “The track kept getting dustier and dustier as time went on,” Wood recalled. “We kept running through the dust on the backstretch coming off Turn Two, then we’d pop out on the other side and you could see again. That went on for lap after lap without incident, until there were about 20 laps left to run in the 100-mile race on the half-mile dirt track. “I went into that dust into a pile of cars wide open,” he said. “It threw me down across the steering wheel, and split my nose and mouth open. I started to get up and get out of the car and I about passed out, so I just sat back down. “I remember seeing Joe Weatherly getting out of his car, and he jumped up on the fence and just hung onto it. All told, 14 drivers were involved. Turner, who had managed to avoid the melee, was the only driver left on the track. So he wound up with the distinction of winning the only major NASCAR race ever cut short by a lack of competition. And Wood, who was credited with third place, ended up with the only serious injury of his driving career. He spent some time in the hospital while doctors patched up his nose. In his driving career, Wood took several other tumbles that left him with cracked ribs, relatively minor injuries especially given the lack of safety features in the race cars he drove, compared to the cars of today. “I went over the bank once at Hillsborough [N.C.] and cracked a rib,” he said, chuckling at the comments of one of the first people to reach his wrecked racer. His experiences on tracks surrounded by fences made of upright boards gave special meaning to the old saying about drivers “knocking the wall down” in a crash. “When you hit it, you knocked the whole thing down,” Wood said. One time he knocked the fence down at a track in Draper, N.C., but it was no joking matter. Wood said that race drivers often will say they closed their eyes just before impact, but in most cases that’s not true. In his case, it was. So it wasn’t until he and the crew were back in the shop at Stuart, Va., that he realized just how close a call he’d had. “We got to looking at the car when we got home with it,” he said. “There was a dented streak, from a board, all the way from the front of the hood to the back of it, and the steering wheel was bent towards me. 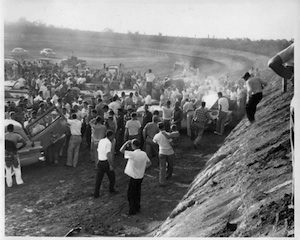 Another time a broken spring shackle launched his car into the air at a track near Floyd, Va.
Then his car slammed into the ground outside the track. “Later I checked my helmet, and it had cracked it,” he said. “And I had dirt in my ear where I had landed on the driver’s side. It wasn’t enough to keep him out of a race car, even that same night. Wood said he never considered himself a daredevil, and he said he wasn’t much for superspeedway racing. “I guess that’s one reason I quit, the speedways were getting really fast,” he said. But Wood still finds it hard to explain how it is, he loved the breakneck speeds of the old beach-road course at Daytona, where speeds on the road portion of the track were much faster than those seen in the early days of Daytona International Speedway, but didn’t like the sweeping new track. “We used to run faster on the sand than we did at the big track at Daytona,” he said. “We ran a two-mile straight run. However fast the car would run, that’s how fast you’d go.